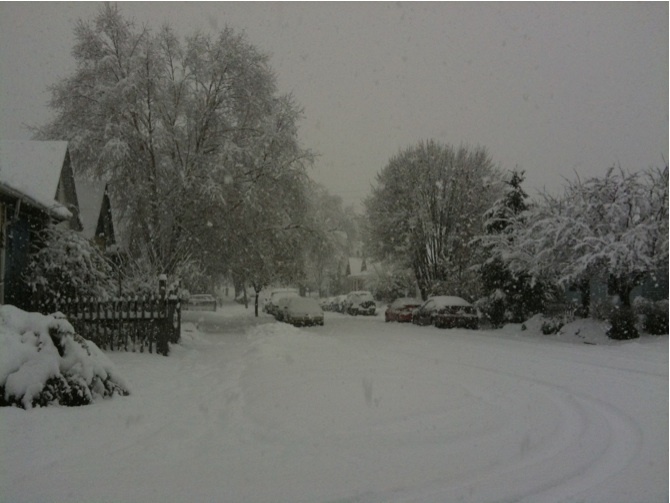 It is snowing–a big, old-fashioned snow as pictured on the Christmas cards. The snow of my dreams, the snow of my childhood–at least as I remember it. I grew up in Michiana glacial lakeland where the prevailing winds brought extra mountains of lake-effect snow from that nearby inland sea, Lake Michigan. Indeed, there was a period of time when the town of New Carlisle, where I attended high school, touted itself as the “Snow Capital of Indiana,” although those in the know were aware that the community of Hudson Lake, immediately northwest over the county line, would likely receive an inch or two more. For children it seemed glorious; over any given winter we could count on about 14 “snow days” off. In the days before computers or robocalls, we eagerly listened to the local radio station rattle off names of closed schools. I would spend hours at a time outside all bundled up. In the yard beside the garage one year was my “igloo”–I think it actually may have a pile of building materials that my dad had gathered for an anticipated project in the spring. I remember it was covered over with plastic sheeting but there was a hollow space in the middle large enough for me. My grandparents lived next door, and in the adjacent lot my grandfather had planted perhaps two hundred white pines sometime after the war. (That would be World War II, but a certain generation always called it “the war” and we all understood.) We had a source of Christmas trees for years! White pines grow very quickly, so that by the time I was in elementary school the trees were thick and fifteen to twenty feet high. A good snowfall turned this little forest into a magic place with tunnels beneath the branches and crisscrossed passages. Such fun! Whenever I headed back into the house my mother would stop me on the porch with a broom to sweep the snow off me, front and back. All this and more came to mind, walking in my urban neighborhood so very different from my childhood home. But the snow took me back. 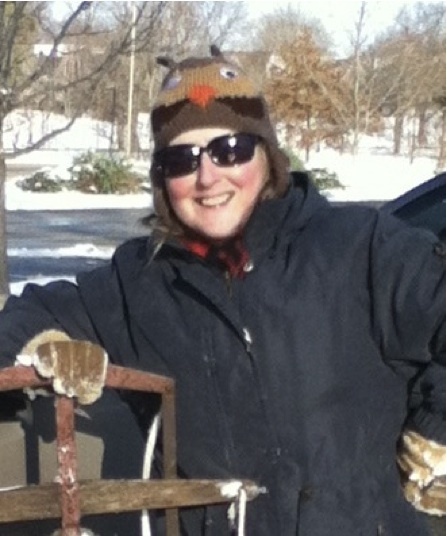 A few days later: Wearing an outfit not so different from what I wore decades ago–longjohns and “snowpants” and thick coat–I head out to a nearby park to go sledding. My sled, scored years ago for less than a dollar at a yard sale, is very like the one I used as a child. Unlike Charles Foster Kane, I cannot with 100 percent certainty recall the brand name of my sled, which was a hand-me-down from a cousin, I believe. It was likely American Flyer but maybe it was Radio Flyer (not “Rosebud,” in any case). I searched the internet hoping a photograph would jog my memory, but instead I was stunned by the prices old sleds go for these days and appalled they were considered merely a decorative item! Sleds were meant to be used! As usual, I am the only one at the hill with a sled of this kind. A lovely bonus to the day was a bald eagle flying low over the park–no mistaking it! Days of bitter cold follow. 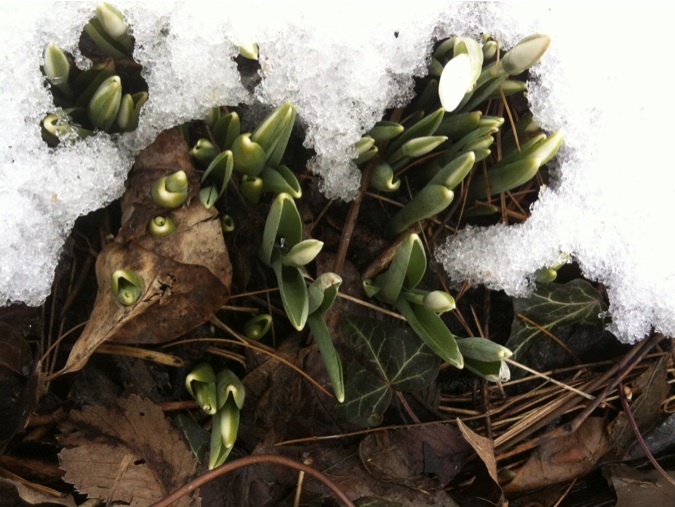 The snow lingers but sunny days melt patches that reveal harbingers lying in wait. A month later: The wonder returns. Another beautiful snow, all fluffy and a lot of it! Snow sifting through streetlights at night seems to create a fantasy land, not that of endless snow and temperatures worthy of Minnesota. But we are tired of the cold. When there is snow, the temperatures are too frigid to play. 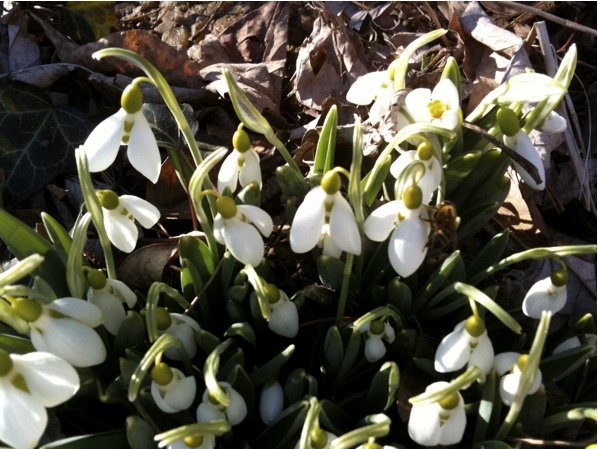 And what of the snowdrops, after all those nights of below zero? A month later, they are still biding their time. Two months later: Surely the last of the big snows (and not so big, at that), but who knows. Perhaps, though, the last chance to go sledding once more. The sun is weak and the clouds eventually prevail. Oddly, the hill is deserted–have kids simply tired of sliding down hills? Have they given up completely? There are, however, some twenty or so squirrels frolicking nearby, as only squirrels can: up and down and tree to tree with mad abandon. I suppose, as I shriek my way down the slope trying to steer around the bumps, that I am exhibiting the same. I never grow tired of it and am grateful for another day on the hills. 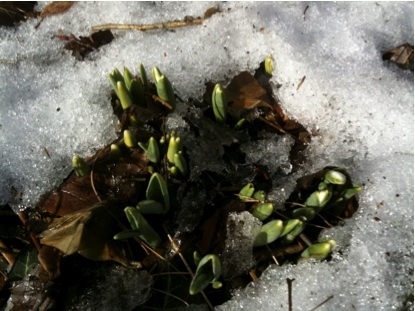 But–the snowdrops are eager, and this snow lasts but a short time. When more than a hint of spring visits for a day or two, we are ready. And so, it seems, are the bees! Climate change brings great contrasts, and after today’s sunny and mild 60s, tomorrow brings rain, sleet, snow–and a sixty-degree thud in temperature. March is indeed an angry lion. The snowdrops will carry on until they are joined by other floral companions. This entry was posted in Country Girl in the City, The Past is Ever Present..., The Wonder of It All and tagged lake effect, New Carlisle, sledding, snow, snowdrops. Bookmark the permalink.